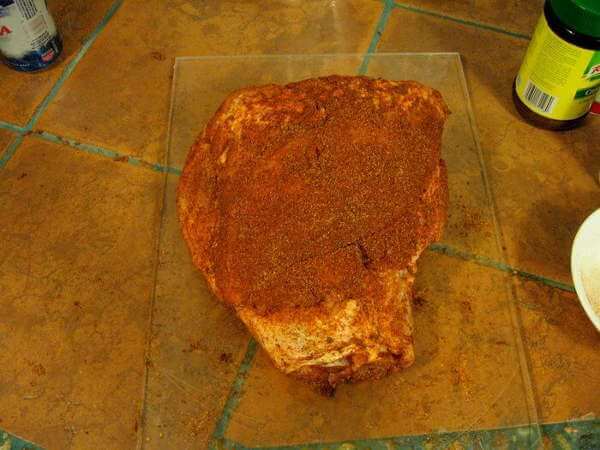 Try this recipe for pork picnic rub next time you have an all day pork shoulder smoke. You probably have most of the spices in your spice drawer already. This simple pork dry rub can be used on any pork you smoke or barbecue. There's no sugar in it to burn, and very little salt. The reason for being light on the salt is that much of the pork purchased these days has been "enhanced" with a brine solution that contains preservatives and/or salt. A salty dry rub just might make the meat too salty, and we wouldn't want that! The bouillon adds flavor along with just a touch of salt. Combine all ingredients and mix well. This makes enough rub for one pork picnic weighing 8 to 10 pounds. Coat all sides of the picnic with the dry seasoning and rub it in. Letting the pork sit overnight in the fridge will make the meat a little tastier, since the flavors will have time to absorb into the meat fibers.